15A Vintage Warbird Aircraft Toggle Breaker. 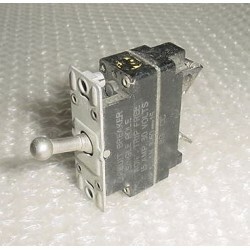 Manufactured by Cutler-Hammer. P/N AN3160-15. NSN: 5925-00-271-8658. It is in good condition. Vintage Parachute Automatic Release Mechanism (1960s). It is a Canadian Royal Air Force Parachute Autorip Mechanism. P/N 1670-21-805-4882. It comes with logbook. Very clean and interesting item. Sold for display only, as is, no returns. ..
2" U.S.A.F. 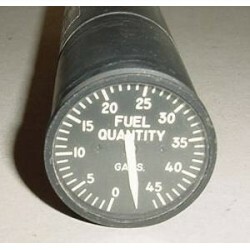 Warbird Jet Fuel Quantity Indicator, capacitor type. Manufactured by Simmonds precision. P/N 383030-02412. 2" U.S.A.F. 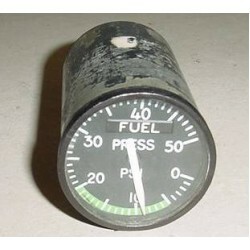 Warbird Jet Fuel Quantity Indicator, capacitor type. Manufactured by Simmonds precision. P/N 383030-02412. Very clean item. It shows very well and it would make an excellent show piece for the bookshelf in the office or home or just as a mock up panel item. Do you ..
2" Vintage U.S.A.F. 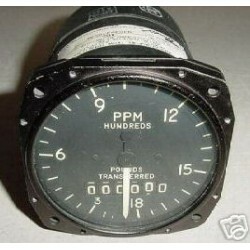 Warbird Jet Torque Pressure Indicator. Type C-30. P/N 1558-041041. 2" Vintage U.S.A.F. 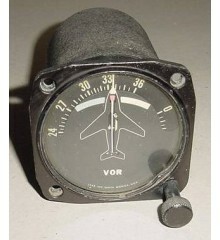 Warbird Jet Torque Pressure Indicator. Type C-30. P/N 1558-041041. Very clean item. It shows very well and it would make an excellent show piece for the bookshelf in the office or home or just as a mock up panel item. Do you happen to know the type of aircra..
3 1/8" U.S.A.F. Warbird Jet Fuel Quantity Indicator. Manufactured by Simmonds Aerocessories, Inc. P/N 383030-11377. 3 1/8" U.S.A.F. Warbird Jet Fuel Quantity Indicator. Manufactured by Simmonds Aerocessories, Inc. P/N 383030-11377. Very clean item. It shows very well and it would make an excellent show piece for the bookshelf in the office or home or just as a mock up panel item. 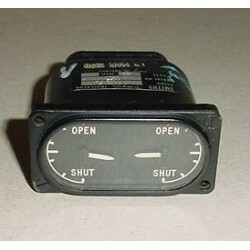 Do you happ..
Vintage Wabird Jet Flap Position Indicator. Manufactured by Smiths. P/N PW/302 FL. Vintage Wabird Jet Flap Position Indicator. Manufactured by Smiths. P/N PW/302 FL. Very clean item. It shows very well and it would make an excellent show piece for the bookshelf in the office or home or just as a mock up panel item. 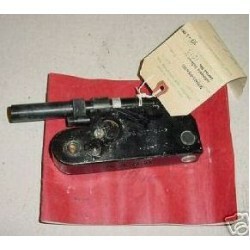 Do you happen to know the type of aircraft ..
3 1/8" Fuel Flow Totalizing Indicator. Manufactured by Bendix. P/N 37704-13A-3-B3. Very clean item. It shows very well and it would make an excellent show piece for the bookshelf in the office or home or just as a mock up panel item. 3 1/8" Fuel Flow Totalizing Indicator. Manufactured by Bendix. P/N 37704-13A-3-B3. Very clean item. It shows very well and it would make an excellent show piece for the bookshelf in the office or home or just as a mock up panel item. 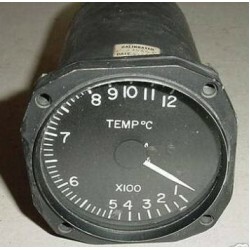 Do you happen to know the type of aircraft t..
2 1/4" Vintage Warbird Free Air Temperature Indicator. Manufactured by Lewis Engineering Co. P/N 47B62. 12V or 24V indicator. 2 1/4" Vintage Warbird Free Air Temperature Indicator. Manufactured by Lewis Engineering Co. P/N 47B62. 12V or 24V indicator.Very clean item. It shows very well and it would make an excellent show piece for the bookshelf in the office or home or just as a mock up panel item. Do..
3 1/8" Vintage Warbird Jet Aircraft Temperature Indicator. Manufactured by The Lewis Engineering Company. P/N 71708-1. 3 1/8" Vintage Warbird Jet Aircraft Temperature Indicator. Manufactured by The Lewis Engineering Company. P/N 71708-1. Very clean item. It shows very well and it would make an excellent show piece for the bookshelf in the office or home or just as a mock up panel item. Do you ..
2" Vintage Warbird Jet Fuel Pressure Indicator. Manufactured by Courter Products. P/N 18-1101. IT is a non-working indicator. Sold as is, no returns. 2" Vintage Warbird Jet Fuel Pressure Indicator. Manufactured by Courter Products. P/N 18-1101. IT is a non-working indicator. Sold as is, no returns.Very clean item. It shows very well and it would make an excellent show piece for the bookshelf in the office or home or just as a ..
2 1/4" Vintage Warbird Jet Fuel Quantity Indicator. Manufactured by Smiths. 24V. Very clean item. It shows very well and it would make an excellent show piece for the bookshelf in the office or home or just as a mock up panel item. 2 1/4" Vintage Warbird Jet Fuel Quantity Indicator. Manufactured by Smiths. 24V. Very clean item. It shows very well and it would make an excellent show piece for the bookshelf in the office or home or just as a mock up panel item. Do you happen to know the type of aircraft thi..
Vintage Warbird Telephonics Headset. P/N H-173A/A1C. It was removed from a retired aircraft that went out of service.